All wildlife, birds especially cannot afford to loose a lot of blood, if you have found an injured creature and it will not stop dripping blood, you must stop it as soon as you can. Missing parts: Completely severed & missing toes, wing tips, beak ends, toe nails, bleeding badly. Put a big pinch of plain talcum powder onto a cotton wool pad and apply it to the bleed and keep a light pressure on the wound for a minute or so. When you peel back the pad the blood should have clotted into the talc and stopped dripping, repeat if it is still dripping as needed. Now get professional help! Compound fractures: Broken bones sticking through the skin & bleeding badly. These are VERY painful in mammals, if they are to be repaired by the vet they must not be contaminated with bits of cotton wool or talc. Use a piece of CLEAN woven cotton, perhaps cut from a clean T shirt (nothing fluffy and no toweling) to apply light pressure to the bleed, piling more cotton pieces on top if it soaks through. Do NOT touch the bones if you can help it. (Imagine they are your bones! be kind!) Keep the wound pristine and clean until the vet can see it, a good method for this is to use a brand new sandwich or freezer bag (or even a piece cut from one) to cover the wound to stop fur and feathers and dirt getting in there. Do not wash or clean or put anything in the wound. Now get the vet! Major internal injury: Visible internal organs showing through the wound such as intestines poking through the skin or food falling out of wounds. This is serious, you really need that vet! Use a piece of clean plastic like a new sandwich or freezer bag to keep those exposed organs clean if there is any hope of operating, if this will do, great! At a last resort you can use clean Tshirt cotton to stop bleeding but only if essential. Minor flesh wound: Small bleeding scrapes, or punctures too small to stitch: Use a cotton wool pad and talc as for a missing part above. 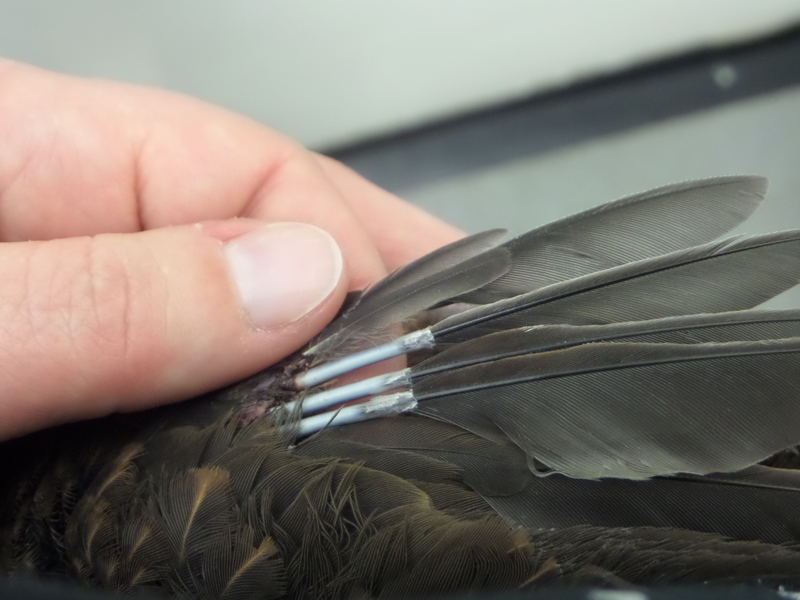 Broken feather shaft / quill: These look like small tubes sticking out where a feather should be. At certain times these are full of blood and will not stop bleeding if damaged. Use a cotton wool pad and talc and apply pressure to the end like squashing a straw. These are hard to stop and may take several minutes.